ZORINSKY, Edward, a Senator from Nebraska; born in Omaha, Douglas County, Nebr., November 11, 1928; attended the public schools; attended the University of Minnesota 1945-1946, and Creighton (Nebr.) 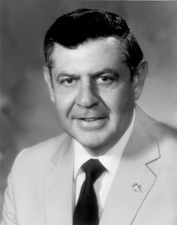 University 1946-1948; graduated from the University of Nebraska in 1949; pursued graduate work at Harvard University 1966; engaged in wholesale tobacco and candy business 1950-1973; served in the United States Army Reserve 1949-1962; mayor, Omaha, Nebr., 1973-1977; member, Nebraska Judicial Qualifications Commission 1968-1971; member, board of directors, Omaha Public Power District 1969-1973; elected as a Democrat to the United States Senate in November 1976 for the six-year term commencing January 3, 1977; subsequently appointed, December 28, 1976, to fill the vacancy caused by the resignation of United States Senator Roman L. Hruska for the term ending January 3, 1977; reelected in 1982 and served from December 28, 1976, until his death in Omaha, Nebr., March 6, 1987; interment in Beth El Cemetery, Omaha, Nebr. U.S. Congress. Memorial Services. 100th Cong., 1st sess., 1987. Washington: Government Printing Office, 1987.